I do not want to jack the thread (that's probably an Aussie euphemism for something I might want to never mind nothing to see here) but DSGamer's adventure inspires me to ask. I am a breed of American who thinks of international travel as being roughly as realistic as building a Dyson sphere. Yes I went to Toronto that one time but that doesn't really count. It's a kind of self-defeating brain weasel. Reading here about folks' experiences pushes back on that weasel and makes me want to travel. Australia has always been toward or at the top of my list (I imagine it shares an aesthetic with Quemado, one of my favorite parts of driving through western New Mexico). I mean aside from city life. What is a realistic budget to start working against for travelling from the US to Australia? Optimally, for a family of four (or five--it's complicated). I'm assuming it's on the order of $10,000, between air fares, hotel, rental vehicle, food, and fees for things I can't even imagine like Cthulu insurance or anti-big-Aussie-creature pants. I had two hernia operations. The first in the summer before my freshman year of high school. I'm pretty sure I'd been carrying it around with me for a few years since moving literally tons of gravel around a yard in Texas to help set up a hydroponic garden. Hernia and hydrocele. Second was as an adult. I guess I have a weak inguinal wall or ring, so maybe that's what your doctor was suggesting. Yeah. Australia kind of shuts down from Xmas to Australia Day. We might be in the office, but it has to be really important to start any time in the first 3 weeks of January. Ignore Bruce, he's only getting in early with the 'potato cake' propaganda because he knows any reasonable person left to their own devices will come to potato scollop, the correct term. Lo, on the left, a potato cake. It's like a salmon cake without any salmon. On the right, a potato scallop. A slice of potato deep fried, like scalloped potatoes. The end. Muraii, the country is so big you're gonna need to jet across it rather than drive; domestic travel will add up with a family as will accommodation. But it sounds like you want a road trip cross country into the true outback, you'll need to research that as there's a lot of wild and dry terrain (or very wet) depending on where you are going. Could be the difference between 4WD'ing vs driving a camper van. It really depends what you want to experience; there was another thread which discussed the merits of each state, but just think, each time you add an exotic or remote location your budget will need to expand dramatically. Per week I'd say at least $3000 ($300/night accommodation plus food and other stuff). Might be less as USD strong against AUD. Also be sure to check up on local driving rules if children under 7 as we have car seat rules that will get you in trouble pretty quickly. Oh and we drive left side of the road. I leave in one day. The extended stay to wait for my surgery date and then wait to get healed has grown old. I'm excited and ready to be there. I have my official visa. I've filled out most paperwork with my employer. Everything is basically packed. I'm nervous about the bag with my medications. I have letters from my doctor for everything, but I'm still dreading customs because I don't want to lose anything coming in. It's almost time to go. Nah, you'll be OK, you've done everything right. Good notes. I just need to start throwing stuff at a budget item and see what it'll get us. This is fairly hypothetical; I'm sure we wouldn't be able to go for at least a couple of years. To be clear, muraii, I have the letters, etc. because I'm on serious medications that are controlled substances and I'm bringing in 3 months of each medication. Also I had a rough year where changing to similar medications isn't going to work and that balance is very important to my health. I'm following the rules from an abundance of caution. I was just saying I was excited that the day is nigh. Ah, yes. After tonight the next time I go to bed will be in my flat in Sydney. I just have to get through that ridiculous flight. Stay hydrated on the flight, brush your teeth at least once, and make sure your tablet is loaded with tons of entertainment options. I have a bunch of movies including Die Hard (never seen it) and a PSP and 3DS loaded with games. A fitting tribute to Alan Rickman (R.I.P.). Enjoy the flight, and welcome to the world of tomorrow! (seriously, you'll be almost a day ahead of the USA). I am very curious to hear what you think about Die Hard now that there have been decades of iteration on the formula. Should watch die hard 2, it's more about Air travel! Oh don't bring the usual fruit suspects like an apple or banana lest you find yourself spending time in Customs. Have a safe trip, weather has cooled so you'll be in for a wet start. What even is that thing on the left? 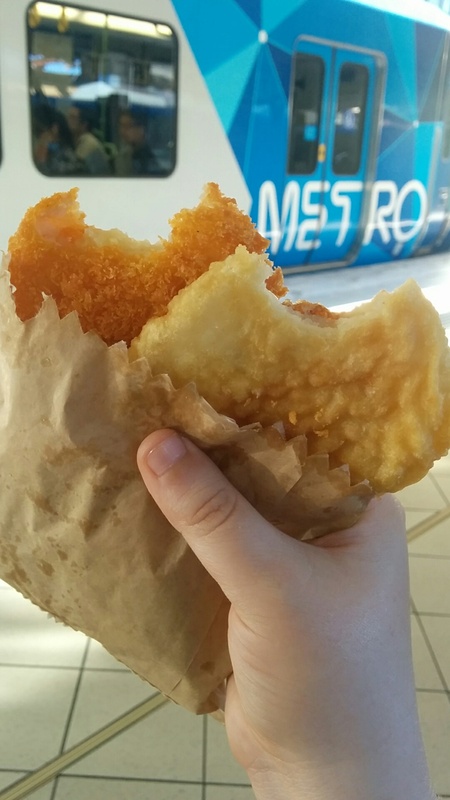 Is it a hash brown or roesti? The right is a potato cake though. I can tell because it is a slice of potato deep fried. Scalloped potatoes are cooked in oven in a tray, not deep fried. On the flight headed to Sydney. Wish me luck on the flight and trying to get my important medications through customs. I'd be surprised if you have trouble DS. You got all the paperwork and you're not inbound from a higher risk origin country. The customs declaration card should be read carefully to see if what you are carrying falls into a prescribed category. And if you're not sure, just talk to one of the customs officials. They are pretty clued up, and are more than happy to help someone who is being upfront, and genuinely looking for help with a legitimate query. Now, before we devolve into a heated, ages old battle, divided along State lines, I think we could all agree that the only correct answer to all of this is "either is a great thing to have the morning after the night before". Yep, it's a completely different place. Nearly everyones on holidays, and those of us left working generally shift into a different gear. It's like the only people left at work are stoners, and if you are gonna harsh our vibe man, this better be really bloody important! As for the potato Scallop debate, I grew up in Tassie where Seafood is plentiful. A scallop was the shellfish, and a potato cake was the battered potato. A mate caused a big scene at a Melbourne takeaway on his first trip north, when he thought $2 for 6 scallops was the deal of the century. We also had a ridiculously simple system for beer glasses. A 10 ounce was the big one. An 8 ounce was the middle size one, and a 6 ounce was the little one. Say what you like about Tasmanians, we have got beer all worked out. I do not see the difference except for one seems more "well done." Are they both not deep fried? All this talk of not working for the 3 weeks after Christmas reminds me of my job. I work for DoD here in New Orleans and there are 2 times when at least half of us are gone and the other half are just standing around and talking about how much cooler work would be if clothing was optional. The week between Christmas and New Years and any given Friday after noon. I'm not saying nobody ever works, but it would have to be "oh my God your hair is on fire" kind of emergency and even then, most would go "well, it's not my hair on fire..."
The one on the right is a slice of potato, battered and fried. The one on the left is like potato bits mashed together and fried, think like a McDonald's hashbrown. What even is that thing on the left? Is it a hash brown or roesti? It's a potato cake from a Japanese place, Tower sushi in this case. The potato inside is mashed and there's peas and possibly carrot inside. Naming rivalry aside, they're pretty good, better than a scallop some days, if a bit more expensive.